If you’re experiencing changes in your vision or visible changes to your eyes, these can be early warning signs of serious eye conditions. No matter how busy you are, you must put aside some time for yourself to get your eyes looked at by a certified optometrist. Check out our previous post on the importance of eye exams for more information. If you’re worried about what happens during an eye exam, check out this video from About.com which shows what happens during an eye exam. 20/20 Eyeglass Superstore is a family owned and operated business with locations in Orlando, Melbourne and Orange City. Interestingly, almost 50% of Americans wear prescription glasses and most of them are guilty of not knowing how to clean their glasses correctly. When cleaning eyeglasses, be sure not to distort or bend the frames or nose pieces. Certain types of metal frames, especially those made of thin wire, are easily bent. If you do accidentally bend them and can’t easily fix them, take them to an optician as soon as possible for repair. We hope you enjoyed our article on how to clean your eyeglasses. If you have any further questions or comments, please feel free to contact us anytime. We look forward to hearing from you. Contact lenses are worn by millions of Orlando residents for a variety of reasons. Some people don’t like the appearance of frames and others want to change the color of their eyes. Contact lenses also provide wearers with more peripheral vision and they don’t accumulate moisture from rain or snow. 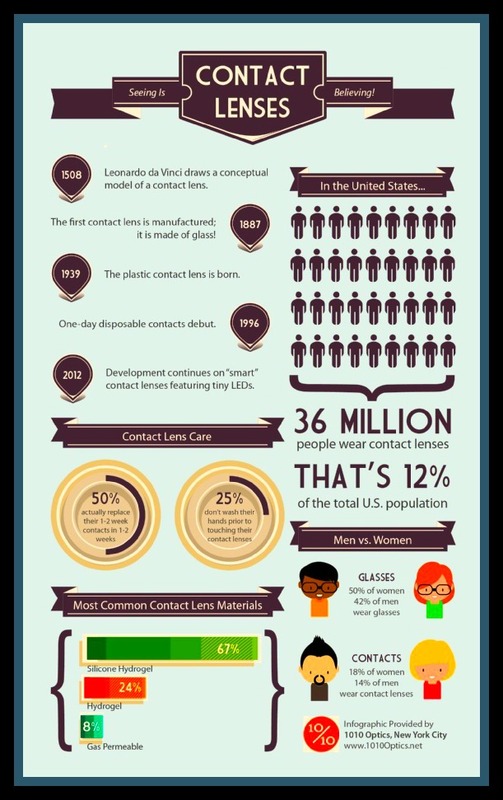 If you’re on the fence regarding contact lenses or eyeglasses, it’s important to consider your lifestyle. If you love to play sports, contact lenses might be a good choice. Another option is buying both – contact lenses and eyeglasses. This way you can have the best of both worlds! Have you ever wondered why you have to start each day by putting on your glasses? If you wear glasses, you already know they help you to see better, but you may not know exactly how they correct your vision. Eye glasses work in the same manner whether they are for nearsightedness or farsightedness. The eye glass lens is curved so that it bends the light rays that hit your eyes so you can see images clearly. Understanding how glasses correct your vision begins with a basic understanding of how the eye works. At the back of the eye is the retina, a layer of cells that react to light. The reaction is sent to the brain, and the brain translates the activity of the cells into an image, or the thing that you see. When your eye looks at something, the light rays come together, or focus, inside your eye. 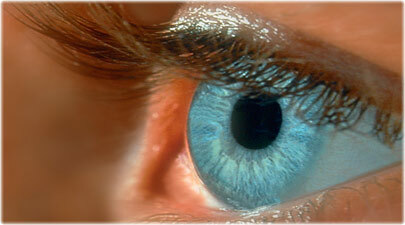 In someone with perfect vision, the rays focus directly on the surface of the retina. The image also must shrink, and it needs to be curved, because the retina is curved. The pupil and cornea are responsible for shrinking, focusing, and curving the image. If they have any irregularities, your vision will be blurry. Nearsighted individuals cannot clearly see things that are distant. This happens because the light rays come into focus in front of the retina. Farsighted individuals have the opposite problem. The shape of their eyes causes the light rays to come into focus behind the retina, causing things that are near to them to be out of focus. Some people have blurry vision due to an astigmatism, or a condition where the curvature of the eye is irregular, creating a second focal point within the eye. All three of these common problems can be corrected with glasses. Eyeglass lenses are curved pieces of glass. The curvature of the lens bends the light rays as they approach your eye. This helps the rays focus on your retina, instead of behind or in front of it. There are two main types of lenses used in eye glasses or contacts. Convex lenses, curve in slightly, are used for nearsighted people. This bends the light towards the bottom and top of the lens, thus pushing the focal point back towards the retina. Farsighted individuals need a concave lens. The light that passes through a concave lens is bent towards the center, pushing the focal point forward. The goal of the correction is to have the focal point hit the retina exactly where it should for ideal vision. The degree of the lens’s curve changes with the strength of the prescription. If you wear glasses or contact lenses, you are in good company. Around 160 million people in the United States alone wear corrective lenses to improve their vision. From that statistic, it seems that perfect vision is a rare occurrence. So when you get up tomorrow, put your glasses on with a little better understanding about how they work. There are literally thousands of options when it comes to buying eyeglasses, sunglasses and contact lenses in Orlando. There are also many options when it comes to finding the perfect frames for your face shape. As almost everyone in Orlando knows, our tagline is, “A Frame For Every Face and a Price For Any Budget”, and we think 20/20 Eyeglass Superstore is your perfect choice for your next vision related purchase. The first priority when selecting eyeglasses is to choose frames that offer the best possible vision for your prescription strength. After that, glasses can be chosen for their appearance and style. All frames are not equally suitable for all prescriptions. Progressive lenses often need a slightly larger surface to function at their best. Prescriptions that address myopia may need smaller frames that center on the wearer’s eyes. Some people find that their vision improves with plastic frames, since the thick edges handle light reflection very well. Make sure the eyeglasses fit the face. If glasses are purchased at the optometrist’s office, trained personnel will measure the wearer’s face and suggest glasses that will fit properly. The wearer will need the information about those measurements to order a pair of eyeglasses online. Choose eyeglass frames that suit the shape of the wearer’s face and his coloring. Usually, this means that the frame shape should contrast with the shape of the face and the size of the frame should be scaled to the size of the face. Eyeglass color should complement the wearer’s skin tone, eye color, and hair color. People with “cool” coloring have a slightly blue or pink undertone to their skin color. Black, blue-gray, plum, and dark tortoiseshell eyeglass frames are recommended for people with cool coloring. People with “warm” coloring have yellow undertones to their skin. Khaki, camel, gold, and light tortoiseshell eyeglass frames look good on people with warm coloring. Eyeglasses should also reflect the wearer’s style and personality. Many people have more than one pair of glasses for just that purpose. Neutral colors and conservative shapes are traditional office wear, while sharply geometric shapes, bright colors, and ornamentation look great in less conventional settings. Eyeglasses are also matched to special activities. Prescription skiing goggles and diving masks, for example, are readily available. Many athletes have sports glasses with tinted lenses or tinted contact lenses to increase the sharpness of their vision under specific circumstances. Yellow enhancement improves performance for tennis players, who usually use yellow balls. Rose lenses make it easier for skiers to see shades of gray that mark bumps under the snow. People who play contact sports should always wear shatter-resistant polycarbonate lenses. Flexible frames and spring hinges are good choices for anyone with an active lifestyle. They’re an especially good choice for children’s eyeglasses. The right eyeglasses will improve vision — but they will also enhance the wearer’s looks, reflect his personality, enhance his performance, and increase his safety. That’s a lot of benefits for one simple pair of glasses. 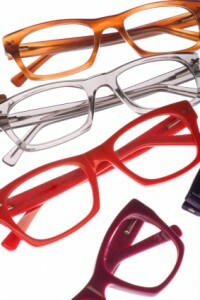 If you’re interested in purchasing new frames for your winter wardrobe, check out our savings section for great deals. We look forward to seeing you in the store soon! Wondering what to do with those old glasses of yours? You know the ones, with the outdated frames and a prescription from 15 years ago? Believe it or not, there are many things you can do with old glasses. Recycle them. Pop out the glass lenses and put them in a glass recycling bin. If the frames are metal or plastic, you can recycle those also, if your city offers those recycling services. Save them. Glasses make a great accessory to many costumes. Remember Harry Potter? Children all over the world were clamoring for glasses on Halloween. Include them in your daughter or granddaughter’s stash of dress-up clothing. Hand your old glasses down. If they are simple reading glasses, chances are someone in your family could use them after you’ve graduated out of them. Ask around with your family and friends. Use them again. If you like the frames, ask your local optical shop to switch out the lenses for your current prescription, or make them into sunglasses. Alternately, if the prescription is good but the frames are outdated, simply purchase new frames. Make your old glasses into a work of art. Be creative. Attach a pair of glasses to a pot for a plant, and glue a nose and a mouth underneath them. Create a sock or paper puppet with your grandchildren, and give it glasses. 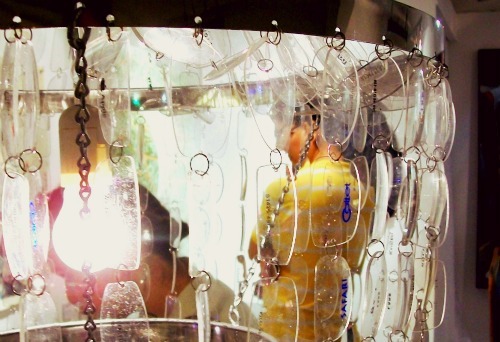 Pop out the lenses, paint them with glass paint, and hang them from a hoop to make a beautiful wind chime. Or, simply let your artist child paint them with acrylic paint. She might enjoy painting on something other than paper. As an added bonus, let her attach sparkling rhinestones to the frames as well. Get silly. Put your old glasses on your children’s snowman. It will be the best looking snowman on the block. Set the glasses gently on your pet’s face and take pictures to share with family and friends. Send them on a trip. Visions Aid Overseas is a charity that sends optometrists overseas, along with glasses, to help communities in developing countries. Pile them neatly into a decorative bowl and set it next to a stack of serious novels. This will make you look like an intellectual. Bonus points if you have an actual library in your home. Use them as a gag gift for your friends and family members who are having a milestone birthday, such as a 40th birthday. Attach them neatly to the top of a gift box, in the center of the bow, or wrap them up and include a hat so that both their eyes and imminent baldness are covered. Donate them. Many charities, collect glasses to give to people in need who can’t afford them. Ask your eye doctor if he knows of such a charity, or simply give them to a thrift store such as Goodwill. You could also ask the director of a nearby nursing home or retirement center if they are in need of glasses for their residents. Donating your old eyeglasses is a great way to pay it forward. Your spectacles will bring joy and good vision into someone’s life. 20/20 Eyeglass Superstore is happy to collect, recycle and donate old eyeglasses to people in need. Don’t forget, bring in your old eyeglasses to any 20/20 Eyeglass Superstore location and we’ll give you $30 off your next pair, pay for your eye examination, and donate your old glasses to those in need. We’ll also give you 15% off your total purchase if you mention this online ad. We look forward to seeing you soon!